Sen. Elizabeth Warren (D., Mass. ), one of the Senate's fiercest Wall Street critics, attended a Democratic donor retreat over the weekend hosted by former UBS bank executive Robert Wolf, who last year lashed out against politicians that target Wall Street for political gain. Wolf hosted Warren as part of the Democratic Senatorial Campaign Committee's annual donor retreat in Martha's Vineyard. He wrote on Twitter that he was "honored" to host Warren, who was joined by other Democratic senators at the fundraiser. Wolf, a financial backer and friend of former President Barack Obama, a Clinton Foundation donor, and a co-chair for the 2016 Democratic National Convention, has in the past portrayed Warren as a radical and denounced her treatment of Wall Street. Back in 2015, while explaining why he was planning to support Hillary Clinton, Wolf said that he thought Warren was too far to the left to win in 2016. "I think you're going to have to keep the center," Wolf said on Fox Business in the months before Clinton announced her campaign. "I don't think if [Clinton] runs, she can be forced to the left where Elizabeth Warren will likely go. I think we're going to stay more in the center." During the DNC convention last July, Wolf criticized candidates such as Warren and Clinton rival Bernie Sanders, who use the term "Wall Street" as a "synonym for economic injustice," according to a profile by the Hill that portrayed Wolf as "the real Wolf of Wall Street." "In a Democratic Party where the populist left—led by Sen. Bernie Sanders (I., Vt.) and Elizabeth Warren (D., Mass. )—uses the term ‘Wall Street' as a synonym for economic injustice, Wolf offers a different perspective," wrote Jonathan Swan. Wolf said that he was growing "tired" of politicians that "stereotype" Wall Street. "Wall Street are Americans just like everyone else," Wolf said. "Please don't stereotype us." 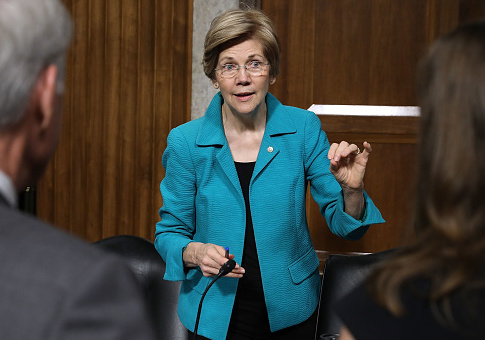 Two months earlier, Warren launched a new coalition of lawmakers and liberal groups called "Take on Wall Street" that was aimed at passing tougher regulations on the financial industry. Among the proposals of Warren's anti-Wall Street coalition was a reinstatement of Glass-Steagall, an idea that both Wolf and Clinton opposed. Warren introduced legislation to reinstate the law in April. Wolf also voiced support for the Trans-Pacific Partnership, a trade deal that was passionately opposed by Warren, who argued that it "would tilt the playing field even more in favor of big multinational corporations and against working families." Warren has also targeted Wolf's former bank UBS for "helping people around the world hide billions of dollars" in an attempt to "boost profits." "Between 2009 and 2014, three giant banks, Credit Suisse, UBS, and Wegelin, were identified as helping people around the world hide billions of dollars from taxing authorities, spouses, and business partners—just so the banks could boost their profits a bit more," Warren said in an April 2015 speech. Wolf was president of UBS Investment Bank until 2012. Warren and Wolf were pitted against each other again earlier this year after the Massachusetts senator said she was "troubled" by Obama's decision to accept a $400,000 speaking fee from a Wall Street investment firm. Wolf defended the fee, saying that Obama is "a private citizen" and that he doesn't "have a problem with how he gets paid." Wolf sits on the Barack Obama Foundation's board of directors. Warren's office did not respond to a request for comment on her decision to attend Wolf's event. Warren didn't make any public announcement over the weekend regarding her participation in the donor event. She did, however, post pictures on Twitter of a town hall she held in Martha's Vineyard prior to the dinner, noting that the event was "what Democracy looks like." This entry was posted in Issues and tagged Democratic Donors, Elizabeth Warren, Robert Wolf. Bookmark the permalink.